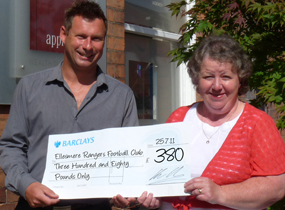 The foundation recently pledged £400 to the Ellesmere team after receiving a request from Rob McBride, the team coach. The money will help with general match funding and much needed kit. Rob said "He was overwhelmed with the gift and can't wait to tell the girls". We are please to be able to sponsor the Tracksuits for the men's football club, and wish them all the success for their season. Applewood Wealth Management Limited have also sponsored the teams home kits. Matt said he was "overwhelmed by Karl's generosity, the kits and the tracksuits will give the team a real professional edge". Rachel Pyner wrote to the foundation on behalf of her good friend Donna to help raise funds for her daughter to have much needed surgery at Bristol Hospital. Evie-Lou is just 4 years old yet cannot walk sit for long unaided and gets about by dragging herself along the floor. Between family and friends they have managed to raise nearly £2000 in 4 weeks but need a lot more. Events such as a silent blackout playing at the Marches School and are looking to host a Christmas fair in the memorial hall on 17th Dec - plus a balloon release in Cae glass park on 23rd Dec. If you feel that you could also make a donation please contact Rachel by email: r.pyner@btinternet.com. Evie has a facebook page that tells her journey so far in her life, click here to view it. Any donations donation that would be truly wonderful.....Many thanks Rachel & Evie's mum Donna. 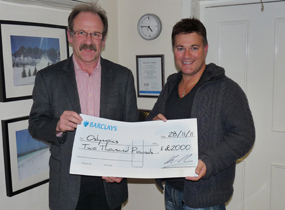 The foundation are pleased to be able to help fund the forthcoming Oslympics event in Oswestry. The event is being organised by Jon Hancock of Oswestry Olympians and will take place in July 6-15th 2012. It will involve all sports and social clubs in the area to come together and host a mini Olympics with parade ceremonies and presentations. We look forward to being a part of the venture and wish Jon all the very best in organising the event. 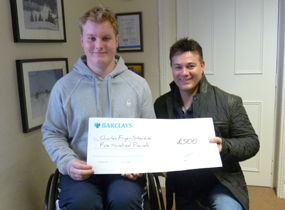 The foundation recently helped with the funding of a sports wheelchair for young Charles Fryer-Stevens. His mother Mary put in a request to purchase the professionally build wheelchair so that Charles can one day represent team GB at Basketball. The foundation have gifted £500 to help cover the cost, although the final cost will be somewhere nearer to £4k, Mary said that she was delighted to receive the money. If there is anybody out there that feels they can also help with the funding please drop Mary and email: maryfryerstevens@yahoo.co.uk The Foundation wishes Charles every success in his sporting career, he is a credit to what can be achieved in the face of adversity. 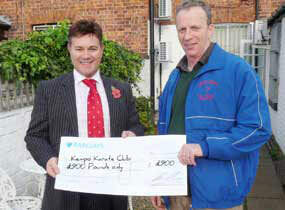 Mike Lade from Osyteers receives a cheque for £500 from Karl Hartey of the Charlotte Hartey Foundation. Mike Lade said "We are very grateful for this support from the Foundation and it will enable us to purchase a much needed trailer to help us in our work in the community in and around Oswestry." 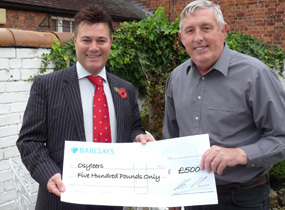 Osyteers was formed to help the elderly and vulnerable in the local Oswestry community. More information on their work can be found on www.osyteers.co.uk Anyone wishing to be a volunteer should contact 0845 463 8486. The Charlotte Hartey Foundation are pleased to be able to support The Oswestry & District CFR Group by purchasing a former paramedic vehicle for the volunteers to continue with there service in and around the local area of Oswestry. 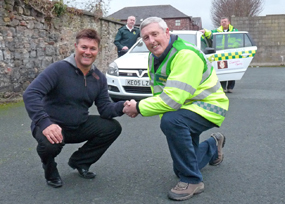 Nigel Keighly of the first response group said "The CFR were overwhelmed by the generosity of the Foundation and is so pleased to now offer and improved and more efficient service in the area". Karl Hartey, patron of the Foundation said "he was pleased to be able to step in and make the purchase of the vehicle achievable, allowing the funds they have previously raised to be ploughed back in to the ongoing running costs of the organisation". The foundation recently donated £900 to Kempo Karate Club to help finance the trip for three young hopefuls, Aaron and Luke Johnson and not Callum Jones aged between 10-12 years old. The boys were chosen to represent England in the European championships in Gyor, Hungary. The competition takes place during the 4th -10th October. Karl said "We wish the boys every success and can't wait to hear of their achievements". After a request was made by Jo M Cox - Senior Practitioner from Targeted Youth Support Team on behalf of Elin Jones, both the Rotary club and the foundation felt they could help pay £500 each towards the transport costs incurred by travelling to and from Oswestry College. Elin Jones aged 20 has been keen to re-enter further education for the last 18 months, but due to a series of operations and a series of setbacks found it increasingly difficult to gear herself up for college. Elin who is a permanent resident of the Neurodisability Suite at Meadowbrook Care Home, suffers from Cerebral Palsy Spastic Dyplegia which has profound effects on both her legs and renders her to an electronic wheelchair. The money gifted will enable Elin to focus solely on her education and focus on attaining the highest grades possible. Neil Ruby of Oswestry Borderland Rotarians said "This money will hopefully alleviate the stress of finding the funds for travel and we wish her all the very success in furthering her education." "This is the first time the Oswestry Border Rotarians and the Foundation have jointly funded a project and both parties are looking to work closely together in future ventures and fund-raising activities." said Paul Seager. 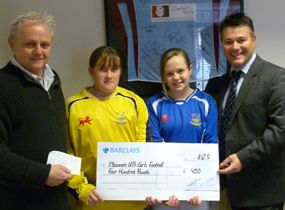 The foundation is pleased to be able to help run a Holiday club on behalf of St Mary's Church, Selattyn. The Club is held for 2 days in the Autumn Half term for the children from Selattyn school and the surrounding area. The money will be spent on buying craft materials, books for the children to take away with them, training for First Aid for helpers, hire of the school hall, hire of equipment for use during the Holiday Club and buying some sports equipment. We hope that everyone who attends have fun and enjoy the event. Rev. Mark Turner said " he was delighted to be able to hold the event and appreciates that funding is getting increasingly difficult to find in the current economic climate". There is a Sunday Church Service held at which craft work produced by the children is displayed and it is also on show for the village Autumn Fair, contact markrhturner@hotmail.co.uk for further details. We are pleased to be able to sponsor the tracksuits for the first and second team at Morda and wish the guys a successful season for 2011/212. 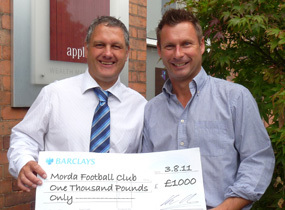 Chairman, Peter Austin said" he was delighted the foundation came forward with the sponsorship and is looking forward to implementing his 5 year vision for Morda Football Club". The Foundation is very pleased to help Ellesmere Rangers Junior Football Club with purchasing replacement nets and fixings for the forthcoming season to the sum on £380. After six years of using, what was once Shrewsbury Towns old netting, purchased when the Gay Meadow Football Ground ceased to exist, the club has finally worn them thin. Margaret Hedge from the club said "She was delighted the foundation helped with the funding, and cannot wait to be able to generate further income for the Foundation by holding collections and fund raising activities." 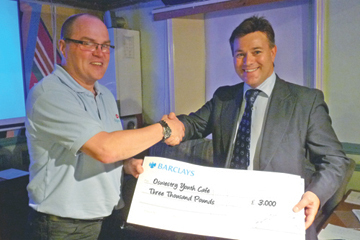 We are pleased to help pay for the general running costs of Gobowen's Scout Group. 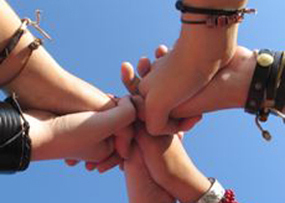 The Village Hall in which the Group Meets is in need of much repair and general maintenance, and the group would really appreciate any other organisations that could step forward with funding. Brenda Cassidy said: "All funding is gratefully received and we are very thankful to the Charlotte Hartey Foundation for getting the ball rolling with their generous donation". We are pleased to announce that the The Charlotte Hartey Foundation have been able to provide the Athletics club with running vests for the schools cross country and track and field events. 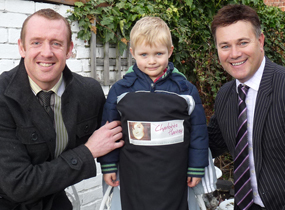 The club has grown from a mere handful of children to over 30 members during the last 18 months. 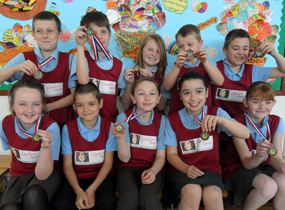 Tracy Bathers said "Having a sponsored kit will make the children feel part of a team and boost their performance, for this we are very grateful". We are pleased to announce that the The Charlotte Hartey Foundation recently pledged £300 to Morda Primary School to help finance their BE ACTIVE week 27th June – 1st July. 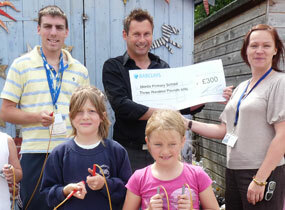 The donation helped pay for a Circus Skills workshop for the children. During the week many other activities took place such as a Skipping Workshop, Basketball and Kwickcricket. Anna Griggs Deputy head said "The week has been a huge success and we are very grateful to the Foundation for making it happen". 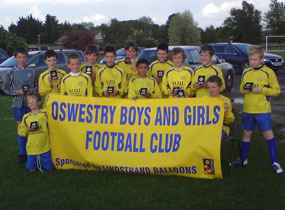 We are please to announce we are able to sponsor the Oswestry Boys and Girls Club Wanderers (U12's) for 2011/12 season. For the second year running the foundation has pledged £800 to The Neurodisability suite at Meadowbrook Care Home, Gobowen, Oswestry. 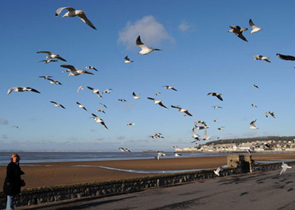 Elin Jones a resident at the Care Home wrote a wonderful letter to the foundation praising last year's coach trip as one of the highlights of the year. Applewood Wealth Management recently donated a lighting rig (valued in excess of £1000) to Llanfyllin High School. 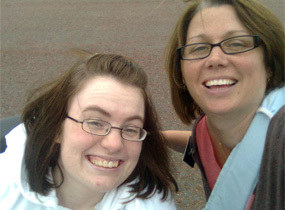 The request came from a Mandy Saunders, Head of Drama. 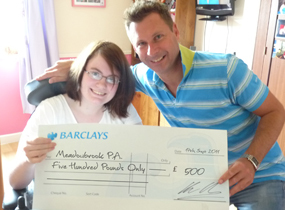 Mandy said "The donation has made their A-level exam piece an extra special performance". Karl Hartey MD of Applewood Wealth Management kindly donated a 42" TV to Viscount Bridgeman Court Residential Housing, Unicorn Road, Oswestry. 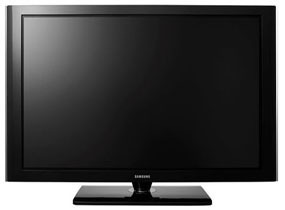 The request came about after their current TV ceased to work 3 days prior to the Royal Wedding of William and Kate. Karl was pleased to be able to provide a ring side viewing experience for all the residents! Karl Hartey attended the AGM at the Oswestry Youth Cafe in April to present a cheque of £3000 on behalf of the Charlotte Hartey Foundation. 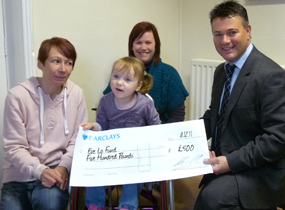 This donation will help towards the continued running costs and maintenance of the Youth Cafe. We are very pleased to be able to support the Victoria Centre, as volunteer group helping support people with learning disabilities in the Oswestry area. The money donated will go towards providing an outing for the group.